Maharashtra Public Service Limited is recruiting for the post of Clerk-Typist. 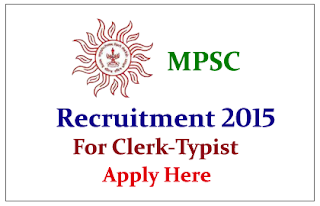 Interested and Eligible candidate can apply on or before 28th July 2015. Company Profile: Maharashtra Public Service Commission (MPSC) is a Constitutional Body established Under Article 315 of Constitution of India which provides a smooth and efficient functioning of the Government of Maharashtra (GoM) by providing suitable candidates for various Government posts and advise them on various service matters like formulation of Recruitment Rules (RR), advise on promotions, transfers and disciplinary actions etc. Qualification: Any Degree / Typing speed of Marathi 30 wpm & English 40 wpm. How to Apply: Interested and eligible candidate can apply online from below mentioned link on or before 28.07.2015. For more details kindly check official notification.